More and more households are buying soda making machines. The devices are available in many different styles, sizes and prices. Some function using electricity and others are battery powered. Many popular soda makers do not require batteries or electricity, which makes them even more environmentally friendly. The machines basically infuse water or a flavored beverage with carbonation thanks to the CO2 cylinder stored in the back of the device. After installing the metallic CO2 cylinder, users need merely put a bottle of water under the front spout. By pushing a button or pulling a lever, CO2 is released into and dissolved in the water to make sparkling water. To flavor the beverage, you need to simply add the recommended amount of flavoring syrup to the bottle of infused water. The syrups come in a wide variety of flavors including cola and root beer. Zero-calorie diet syrups are also sold. Depending on the size of the CO2 cylinder owners are able to create 60 to 130 liters of carbonated beverages. Once the cylinders are empty, they need to merely be returned to the company or the location where the machine was purchased and trade them in for a refill. There is a fee for each new cylinder. Each soda making kit typically comes with one or more BPA-free plastic or glass bottles that can be used over and over again. However, they do have an expiration date and must be replaced as recommended. The companies that make the machines also offer replacement beverage bottles and other accessories. In this way, households using the machines spare the planet from unnecessary aluminum, glass and plastic trash. The bottle-created beverages also taste better, as they do not have the tinny taste often associated with drinking out of aluminum cans. The main advantage of making your own soda at home involves being able to control the ingredients. You have full control of the amount of sugar you consume. In many cases, you need only add a few drops of concentrated flavoring, which greatly reduces sugar intake. Soda making enthusiasts have also developed their own syrup recipes and readily share their concoctions with others. Some have devised ways to create carbonated fruit juices, wines and cocktails. The tabletop model does not require an inordinate amount of space and features an attractive tall, slender design with a glossy black finish. The base of the soda maker is 5 inches x 7 ¼ inches. The unit stands 17 inches tall. The SodaStream is extremely easy to use. Owners need to simply choose from one of three different levels of carbonation by depressing one of three buttons located on the top, rear of the machine. 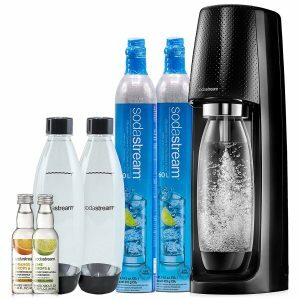 Each SodaStream package comes with the SodaStream machine, one 60-liter cylinder of CO2, one 1-liter BPA-free bottle and an AC adapter. Simply pop off the back cover from the unit. Remove the wrapper and cap from the cylinder and screw it into the machine. Replace the back cover. Attach the adapter to the bottom of the soda maker and plug it into any common household outlet. Fill the bottle to the recommended fill line with cold water. SodaStream machines function using water only. Attempting to use juice or other fluids causes a mess and may ruin the nozzle. Insert the bottle into the front of the machine. Make sure that the nozzle is in the bottle. A clamp holds the bottle firmly in place during carbonation. Choose your desired level of carbonation and press the appropriate button. Once the light on the button turns off, the process is finished. Remove the bottle and add your favorite flavoring. The machine is easily cleaned using a damp cloth when needed. SodaStream offers a variety of BPA-free plastic and glass carafe replacement bottles and caps, which are available in 0.5 or 1-liter sizes. Each of the bottles is interchangeable with all of the SodaStream machines. The company also offers 32 different flavor syrup options. Each bottle contains a sufficient amount of syrup to flavor up to 16 liters of carbonated water. The company offers a 30-day money-back guarantee return policy on all of the SodaStream machines. After acquiring the unit, registering the product via the SodaStream website provides the owner with a warranty. The extent of coverage provided varies from one soda maker machine to the next. 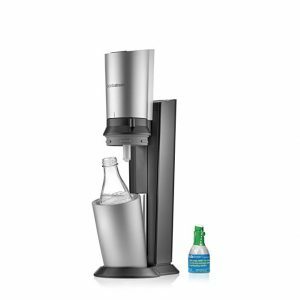 The Crystal model made by SodaStream is considered a more elite machine in terms of design and function. The soda maker features an attractive matte stainless steel finish. The head raises and lowers, which conceals the nozzle. All that you see when the device is not in use is the slender cabinet. The machine does not require batteries or electricity for operation, which makes it extremely portable to use in any room, outdoors or away on picnics. The small size of the base does not require much space. However, the top of the machine raises to accommodate the included 1-liter glass carafe, which might make it difficult to use beneath many kitchen cupboards. The kit comes with the soda maker, the dishwasher-safe glass carafe, one miniature CO2 cartridge and a 60-liter CO2 cylinder rebate. The miniature cylinder makes up to 9 liters of carbonated beverages. Using the Crystal involves removing the rear cover and installing the CO2 cylinder. Unlock the front of the machine by pushing the lever sideways. Insert the pre-filled water bottle into the holding well. Lower the head and lock the machine. Depress the button on the top of the unit three times or until achieving the desired carbonation level. Unlock the machine and remove the bottle. Although attractive in style, the way in which the machine was created does not allow owners to use the larger 130-liter CO2 cylinders, which may be a put off for some. The Fizzi bundle is the ideal kit for first-time users, as it has everything you need to start enjoying homemade carbonated drinks. The package comes with the Fizzi carbonated water maker, one 60-liter CO2 cylinder, two 1-liter BPA-free beverage bottles, one 0.5-liter BPA-free bottle and caps. You also get one 40-milliliter bottle of lime flavoring and one 40-milliliter bottle of lime flavoring. The device does not require batteries or electricity, which means you can take it anywhere. 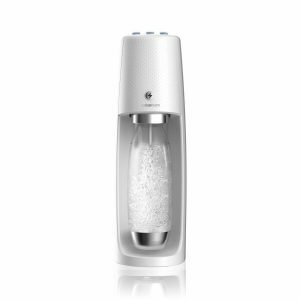 The SodaStream Fizzy also comes equipped with a fizz chip that monitors CO2 usage. In this way, owners are able to tell how much CO2 remains and when to change the cylinder. You can also use the monitoring system to gauge the amount of CO2 used in each beverage. The soda maker is so easy to operate, a child can capably make their own beverages. Using the device merely entails installing one of the CO2 cylinders. Pop a pre-filled water bottle into the front of the unit, which automatically grabs and locks the bottle into place. Push the button on the top of the machine to achieve the desired level of carbonation. Clean-up simply requires using a damp cloth as needed. The Fizzy also comes in your choice of a black, white, red or light blue finish.